Ben has extensive teaching and coaching experience gained over a decade during which time he has experienced a wide range of teaching/coaching methods, types of training/teaching, in different settings and with a range of differing principles, learning and taking the best from each of them. Ben has worked with many teachers and coaches over the years both in swim schools and at both Lincoln Pentaqua and Lincoln Vulcans, including most recently Fred Furniss. Through his swimming employments Ben has links to both Lincoln Pentaqua and Lincoln Vulcans Swimming Clubs, a number of local swim schools, including Swim 'n' Go, Branston, and the Priory City of Lincoln Academy Swim School (City School). Ben is also involved in school curriculum swimming. Ben works to an ethos of discipline (regardless of age), precision, hard work, belief and a drop of fun and believing it is the responsibility of the teacher/coach to set each swimmer on the right path, motivate and guide them to achieve their goals. Ben knows from experience that whatever level/age of swimmers you are dealing with, if you commit yourself totally to their success, take it upon yourself to personally guide them towards their goals and take pride in their achievements (no matter how small) this ultimately motivates the swimmer to want to succeed themselves and raises them to achieve their goals. Praise and ongoing feedback are vitally important to this process. Ben is the founder of the Taste to Race Scheme which provides swim school swimmers with a "no strings attached" opportunity to experience the thrill of racing and obtain information about competitive swimming whilst remaining within their swim school, without the pressure of joining a club. 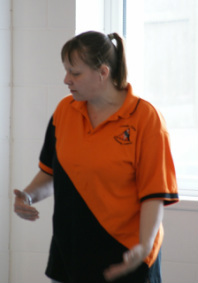 Caroline has similarly been coaching/teaching for many years, although not to the same extent as Ben. Caroline shares Ben's ethos and beliefs as to the fundamental role of the coach in swimmer motivation and success and believes that attention to detail is often the key. Committed to developing swimmers with good technique built on solid foundations from the start.